Is homeownership a good thing or not? Lately we've been hearing from various economists on the value of homeownership in a society, arguing that due to the latest economic meltdown created from the housing bust that many people should remain renters forever. And that's a valid argument. But should that argument be extended to predict the end of the single-family home forever? From my own experience, renters aren't as involved in community affairs as owners (in fact without the advantage of automatic sprinklers, grass and other greenery would die because many don't seem to even want to water the lawn), and for all of these arguments that 'if you put the same amount that you'd pay for a mortgage into an interest-bearing account' the chances of that happening across the board are so small it's almost laughable. For many people, buying and paying off a home over time is a time-tested strategy to build some wealth -- regardless of swings in the market over a 30-year period. (Note: For years, Leinberger led a well-known consulting company with multiple offices which specialized in master-planned communities, and for which I also consulted in the mid 1990s. One has to wonder how many such communities were built because of the supporting documentation his company created. Perhaps he simply had a change of heart and now realizes that sprawl wasn't the way to go, but I've never seen or heard anyone tie this rather obvious disconnect together). (Note: Of course Florida lives in Canada, where there's no tax advantages to buying a home, so Candians have to bank on building equity by paying down a mortgage or hoping the value goes up. But it's still possible that the 'creative class' of whom he speaks won't want to be homeowners even with tax advantages). Home prices in 20 metropolitan areas were down 18% in April compared to the same month the previous year, according to the S&P/Case-Shiller home price index. In the Los Angeles area, which includes Orange County, April home prices fell 21% from the previous year. Los Angeles County and Orange County prices in April were down 42% from their 2006 peak, the index shows. The 20-city index was down 33% from its 2006 peak. While Los Angeles area price declines have slowed, Charlotte, Chicago, Cleveland, New York, Portland and Seattle posted record year-over-year declines in April. The worst year-over-year declines in April were in Phoenix (35%), Las Vegas (32%) and San Francisco (28%). Los Angeles area price declines have varied substantially by price segments. The lowest-priced third of homes sold in April is down 54% in price from its peak, according to Case-Shiller; the middle third was down 42%; and the most-expensive third of homes sold was down 31%. Nontheless, because the mid-level and upper-price tiers depend largely on buyers moving equity from the entry-level tier, it's only a matter of time before we see price declines even out, and that process is already starting in certain markets. Interview tomorrow with Robert Shiller, co-author of "Animal Spirits"
On Wed., July 1st at noon (Pacific time, 3pm Eastern time) I managed to snag an interview with Robert Shiller, Princeton University professor, co-founder of the S&P/Case-Shiller index and co-author of the new book "Animal Spirits: How Human Psychology Drives the Economy, and Why It Matters for Global Capitalism" for my Housing Chronicles show on BlogTalkRadio.com. You can either listen to the first 15 minutes streamed live or listen to the podcast afterwards (I'll post a link). I'll be citing this interview for my upcoming review of the book for Inman News. And why is that? Because they refuse to throw away the dog-eared rule book which made them successful in the first place -- and perhaps to be surpassed by companies which never bothered to read one. In today’s world, new rules are constantly being written by the brash and the creative, whether it’s Google’s transformation of the advertising world or the huge success of the CBS franchise “CSI.” For example, not only did CSI creator Anthony Zuiker have zero experience writing for television, he also didn’t realize that including flashbacks and quick cuts were both against long-standing industry convention. Not knowing any better – because he never read the old, stale rulebook – he included both, thus giving the original series a pace and look that quickly sent it to the top of the ratings game and launched two spin-offs, one of which is the most-watched show in the world. So is that just dumb luck or a sea change that will cut across all industries? I think that even more potent forms of creative destruction are about to envelope the building industry, and it won’t just be about building more in-fill product or scaling down home sizes and prices to meet today’s demand. These changes are going to alter everything from supply chain management to the way in which homes are marketed and sold, and those veterans who keep themselves otherwise occupied while waiting for someone to call and ask for their outdated skill set may be in for a long wait. While there will certainly be some demand for the impressive homes of the past, we’re also quickly seeing a return to designs that meet needs more than wants. This is especially important for the groups of people mostly left behind during the last building boom such as families, seniors, the disabled and the homeless who can only afford to live in housing made possible by tax credits, low-interest bond financing and various other government programs. For example, in upscale Thousand Oaks in California’s Ventura County, our staff is currently drafting a report in support of an affordable housing project that will help to house a variety of low-income families, homeless persons and the mentally disabled, many of whom now are mere numbers on a wait list that’s close to 600 families. And who’s hoping to build this 60-unit project? A local non-profit that has managed over the last 30 years – mostly under the radar – to build, rehabilitate and fill 400 units and provide housing for 1,000 adults and 200 children. It’s that type of story (along with appropriate private and public incentives to make it happen) this industry really needs to start telling more of around a campfire – assuming, of course, that the old rulebooks are helping to provide the kindling. Ever wonder why we Californians seem to have so much trouble governing our finances? Well, it wasn't always this way, and, as a 7th generation California native, I can personally attest to a huge variety of changes, instituted in large part by a populace that moved from *other* areas to then impose their own will on the rest of us (such as freebies for everyone but no way to pay for it). Being lucky enough to be born when I was, I enjoyed a solid public education, a safe neighborhood, friends and neighbors who shared similar values, an enviable infrastructure and a state-supported university system that was among the best of the world. When it changed, it just wasn't due to Prop. 13, although that was the start of it. I remember joining my family to protest the proposition (my first foray into politics), and when a cigar smoke-smelling Howard Jarvis waddled by and told my brothers and I, "Why don't you go home and learn to read?" I'm sure he didn't realize that home schooling would become the savior for many of today's families. In the next few weeks, a blue-ribbon commission is set to recommend sweeping changes in the tax system to stabilize revenue collections. Voters last fall approved Proposition 11, which takes away the Legislature's power to draw its own districts in favor of an independent commission. Next year, as they elect a new governor, Californians also will vote on a system of "open primary" elections aimed at aiding moderates, and they also will probably decide on one or more initiatives to dump the two-thirds budget vote requirement. The median sale price for a new home in May was $221,600, down 3.4% from a year earlier. Inland new home sales in April were down 20 percent from April 2008. That is lower than the 28 percent year-to-date decline compared with the first four months of 2008, and the 41 percent decline seen for the period of May 2008 to April 2009. "That tells me that we're getting closer to the bottom," said Patrick Duffy, a principal and analyst with MetroIntelligence Real Estate Advisors in Los Angeles. National experts said that without bigger price cuts, builders may keep losing market share as the jobless rate and foreclosures climb, aggravating the drop in resale prices. Next book review: "Animal Spirits"
For my next book review for Inman News, I selected the book "Animal Spirits: How Human Psychology Drives the Economy, and Why it Matters for Global Capitalism" by economists George Akerlof and Robert Shiller. The reason I chose it was because few markets are more prone to human psychology than residential real estate, so I was hopeful that the book would provide some tools to real estate agents to educate potential buyers when deciding to enter into a deal. I'm also trying -- so far unsuccessfully -- to grab 15 minutes of Dr. Shiller's time for a brief, 15-minute interview for my HousingChronicles show on BlogTalkRadio (and also to help with my review). Since I've interviewed the authors of nearly every book I've reviewed for Inman News and the L.A. Times -- including other noted economists such as Richard Florida and Mark Zandi, who regularly testifies in front of Congress -- I was thinking Dr. Shiller would be willing to do the same. However, since the PR rep for his publisher is having zero luck scheduling this interview, if any readers of this blog have any sway with Dr. Shiller, you'd have my gratitude to intervene. While the lack of an interview certainly won't stop me from writing the review, I'd find it much easier to tie it directly to the Inman News audience with a few specific questions. After all, this isn't the type of book to which your average real estate agent would gravitate, so I had to talk my editor into letting me review it in the first place. Keynesianism, Reaganomics and Thatcherism? I can't wait! In between the turmoil in Iran, the impending Gosselin divorce, a stock market that can't decide which way it wants to go and an attack on celebrity blogger Perez Hilton, it's hard to think of one more problem to be solved, but this one is important. 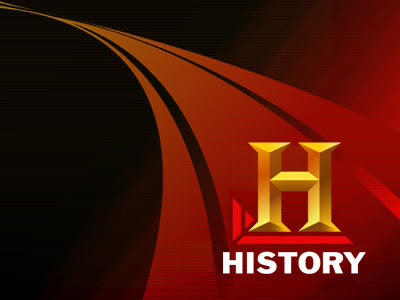 The History Channel is currently running a two-hour special entitled "The Crumbling of America," and what it shows is quite sobering. Even to bring up the country's crumbling infrastructure back to where it should be will cost -- you guessed it -- trillions! And who's to blame for this long-delayed maintenance? This month we are pleased to introduce the newly expanded California and U.S. Employment Report from Beacon Economics. Our datasite now covers key employment statistics in all 50 states. For each state, breakdowns are available by major regions and industries. See instantly how retail trade employment is doing in Colorado... find out which region of New York has the largest number of jobs... see how Florida's unemployment rate has changed over the past 6 months, year, or 3 years. Explore the detailed data available and gain new perspective on the nation's employment landscape. I think this a great and easy-to-use service (and best of all: it's free!). So what do the folks at Beacon think about California? Last month, Beacon Economics wrote in this employment report that the decline in California's unemployment rate in April was likely a statistical blip. This month's numbers confirm that suspicion. Unemployment Hits Record High: On a seasonally adjusted basis, the state's unemployment rate hit 11.5% in May - the highest on record since these statistics have been reliably tracked. The number of people classified as unemployed in the state shot up to 2,138,000 from 2,065,477 in April. State Employment Falls Back to '03 Levels: Total nonfarm employment in California dropped another 68.9 thousand in May. This 0.5% decline pushes employment in California back down to 2003 levels. I keep hearing stories of bored entrepreneurs buying up blocks of homes at a time in order to "hire a management company and rent them out!" Oh, if it were only so easy. Unfortunately, not all management companies are created the same. Last year I had to fire one for a variety of reasons including incompetence, unprofessional behavior and hiring shoddy subcontractors (in fact, I was thinking of pitching such a cautionary tale to the L.A. Times, but once I hired a new company I just wanted to be past the experience). But at least my property is local! A year later, while writing a book about the housing boom, I decided to dive in myself. In late 2006, after seeing only e-mailed photos, an appraisal and an inspection report, I paid $62,750 for a two-unit rental property in Pocatello, which is 2,450 miles from my Massachusetts home. I didn't expect to get rich; my main motivation was to have a good story for the book. "California's home building industry is in the worst shape ever," said Horace Hogan, chairman of the California Building Industry Association, the trade group that puts on PCBC, and president of Brehm Communities, a Carlsbad (San Diego County) home builder, speaking at a news conference. Hogan had a variety of grim statistics to tick off. Although the 65,000 housing starts in California in 2008 were the lowest ever recorded, "As bad as last year was, right now 2009 looks like it might even be worse," he said, citing projections of only 40,000 housing units this year. That sluggish pace means the loss of more than 360,000 jobs and $50 billion from the state's economy, he said. California's $10,000 tax credit for people who buy a new home is something the builders would dearly like to see extended. They say not only does it help their industry, but it generates state and local taxes, creates jobs and stimulates the economy. Sam Chandan, president and chief economist of New York's Real Estate Econometrics, had more downbeat news at a session on the economic outlook, predicting a huge wave of defaults in commercial mortgages. "About $300 billion in commercial mortgages will come due between now and the end of 2009, and the same in 2010," he said. "We lack the capacity to refinance them. This will lead to a significant increase in defaults and delinquency rates for commercial mortgages..."
During the last downturn of the early 1990s in California, people could choose to find a job in another industry or move temporarily to Las Vegas or Phoenix to find work in the local building industry. But now with the entire economy in recession, there are few good substitutes. And as for those commenters you always see online (probably sitting alone in their underwear) who quack, "Greedy builders! Had it coming! Get what they deserve!" please give it a rest, it's just not helpful, nor is it original. You could say the same thing about bloated governments, badly managed car companies, irresponsible bankers or media companies which haven't reacted quickly enough to the creative destruction fomented by technology. Like it or not, we're now in this together, and quacking out the same tired lines of schadenfreude is just boring. The Southern California median home price last month was $249,000, down 51% from May 2007, according to figures released Wednesday by MDA DataQuick of San Diego. It's the fifth straight month that median prices have hovered around $250,000, though May did show a slight increase in prices for the region. Despite some healing in the national economy, California still faces significant difficulty, in part because of the state's budget woes, economic forecasters at UCLA say. Bill Watkins, executive director of California Lutheran University's Center for Economic Research and Forecasting, agreed with the Anderson group that California faces a rougher road than the rest of the nation. So who's right and who's wrong? Well, UCLA insisted there was no recession until it was so painfully obvious they had no choice to reverse themselves (and without ever admitting any fault), and Chapman was so off on their projections for Orange County that the local BIA group decided to give another economic forecasting group a try for awhile. I guess we'll have to wait until 2011 to see! It's interesting these days to listen to economists or pundits who read through reams of data and declare, "There's plenty of credit -- just not at the price you want!" and then actually sit down with those who are trying to get deals done, and it's a very different story. Unfortunately for builders seeking capital, real estate loans represent a major factor in those losses. Last year, banks reported net charge-off rates of 0.99% for all loans and 0.73% for real estate loans for the first quarter. This year, those figures doubled, to a net charge-off of 1.94% for all loans and 1.44% for real estate loans. A similar trend occurred in noncurrent loans, which are at least 90 days past due. Overall, banks said 3.77% of all loans were noncurrent in the first quarter of this year, compared to 1.72% one year ago. A prime offender? Real estate, where the percentage of noncurrent loans jumped from 2.21% in 2008’s first quarter to 4.89% for 2009’s first quarter. Within that category, construction and development lending is the most troubled, with nearly 11% of such loans more than 90 days past due. Many banks, already weighed down by significant numbers of real estate owned (REO) properties, are wary of adding any additional land investments to their books, even in relatively low-risk joint ventures where the bank supplies the REO land and builders simply construct the homes. Lack of resources may be another issue, particularly at smaller banks. At the same time as builders are begging and pleading for funding, lending institutions are dealing with a host of other challenges requiring time and resources—new credit card laws, personal and corporate bankruptcies, foreclosures, and mortgage modifications. They simply may not have the people, time, or expertise to carefully evaluate a builder’s proposal, no matter how promising. The future of homebuilding is -- spiritual? Zogby outlined four pools of people who share this spiritual connection. A sizable portion of the population, he said, is now working for less. They have de-emphasized what they own or where they live to define themselves. "They are the new American consumer," he said, adding that these are smart consumers who will shop for bargains but save money to buy something nice they really want. It's a mistake to try to reach this group by marketing fantasy; reality is what appeals to them. A second cohort of 9 to 10 million Americans has done very well in life, but it is now making a conscious decision to stop materialist behavior. They may decide not to do a 4,000 square foot addition because they aren't fully utilizing the 5,000 square foot home they already have. They don't want the hassle of owning even more. "There's a real movement toward simplification," Zogby said. Aging baby boomers, 78 million strong, are a third source of secular spiritualism. Many who believe they changed the world when they were 19 are now looking for a second act as they turn 60. Zogby suggested that this generation, instead of looking forward to retirement, is searching for "encore living," a way to spend the remaining years of their life giving back to society through volunteer work and other endeavors. The fourth group of spiritualists is inclined toward personal sacrifice. "One of the great untold stories of the last 25 years is the revolution in recycling," said Zogby, who did some of the early survey work with local governments that revealed a latent desire to recycle. "Americans are looking for the next wave of sacrifice," he said, suggesting that it will be in the area of sustainability. "We are citizens of the planet Earth." Besides appealing to buyers looking for spiritual fulfillment, Zogby recommended that builders pay close attention to the behavior of Generation Y, which are 18- to 30-year-olds. These are America's first global citizens, he said, citing polls that show 56% have a passport and travel abroad, and one fourth say they expect to live and work in a foreign country within their lifetime. This group communicates through social networks with friends from foreign countries. They follow international sports. They may marry people from foreign countries. They are a mobile group that wants to cluster in urban areas. They will have an average of four jobs before they turn 30. "They may not want to live in the same place forever," said Zogby, arguing that this demographic will create new forms of shared homeownership to accommodate their mobile lifestyle. In conjunction with Pepperdine University and the L.A. Chamber of Commerce, MetroIntelligence partner Beacon Economics has announced their inaugural Los Angeles Economic Conference for July 28, 2009 at the Los Angles Airport Marriott (near LAX). Want to register? Click here. MetroIntelligence is also offering clients and blog readers a special discount code for this event -- email us at info@metrointel.com! Leading economic forecasters, top academic researchers, and a high-profile CEO panel make this a "must see" event for decision makers from across private industry and the public sector. The buzz has already begun...and seating is limited...so register today! The stock market is screaming a "V" but bonds "U." What will this recovery look like for the state, the nation, and Southern California? My column for the June issue of Builder & Developer magazine is now online. The subject this month is on the current state of real estate journalism, and what builder & developers can do to encourage more balanced reportage from not just traditional reporters, but also from bloggers as well. I wrote it because I was mourning the passing of L.A. Times reporter Annette Haddad, whom I think really did want to get a story right and include all of the necessary angles. But I also wanted to impart some tips I learned from my own freelance writing experience for the Times, when getting a builder to comment for a story was akin to ordering manna from heaven. In other words, close to impossible. Since I know it's certainly not in any company's best interest -- in any industry -- to prefer to see the the line "Company x didn't return calls for comment" published for all to see, I can only assume such reactions are due to poor communication, management or both. You can read that column here. For the entire June issue's table of contents, click here. Lately, it seems to be the criticism du jour to pin the entire (rising) federal deficit at the feet of Barack Obama, who has only been in office since January. Meanwhile, I continue to get somewhat unhinged email blasts from some of my more conservative friends who, quite frankly, don't know what they're talking about when they drone on about Obama's policies being the end of civilization as we know it (as well as the apparent end of baseball and apple pie). Of course I want to reply, "Perhaps you should get that pesky bankruptcy off your credit report before throwing stones at Obama's fiscal house!" but I'm simply too polite to do so. And something that won't be addressed simply by "Drill, baby, drill!" I got a phone call yesterday from a friendly competitor of mine, and apparently the desperation that has afflicted much of the real estate world has now started to impact the world of real estate consultants -- those firms which are hired by builders, developers, lenders and municipalities to conduct (supposedly objective) research on the feasibility of proposed development projects. This is interesting to me because the same companies which advised me to "never, ever" discount fees or risk making what we do a commodity item, have discounted so steeply that it seems they're doing whatever they can to simply keep the lights on and the rent paid on the commercial space they've rented. Not all, but certainly some. One way I think they're making do these days is with what my business partners at Beacon Economics and HousingEcon and I call 'the data dump.' Rather than tie together various indices with a useful narrative and attempt to *accurately* forecast when sales or prices might stabilize, they think their clients -- much like a newborn baby in a crib looking at a shiny mobile -- will be so pleased with reams of data depicting tables and charts that they'll never bother to read whatever narrative was included, nor will they ask questions if the data doesn't support the conclusions. In other words, it's often simply a report for the file. That's why now, more than ever, clients get what they pay for when selecting consultants of any type, whether it's an attorney, an accountant, a financial analysts or a market feasibility expert. After all, it's just not realistic to waltz into Target or WalMart and expect to get the same quality you might find at Nordstrom or Saks. We saw that happened during the boom years, with the data dumps masquerading as genuine analysis -- global economic meltdown and unemployment of over 80% in the state's building industry. And let's try not to repeat that, shall we? It's more than just price alone. Properties in several areas are selling for less than they did 20 years ago, and that's not even counting the effects of inflation. Home prices across most of Southern California have not fallen nearly as far. The median price in the six-county area was $247,000 in April, about what it was in 2002. But in 14 Southland ZIP Codes, mainly desert communities in the Antelope Valley and Inland Empire, median prices have fallen below levels recorded in April 1989, according to MDA DataQuick, a San Diego real estate information service. Miss the Inland Empire Economic Forecast Conference? As less-than-honest mortgage brokers look for their next victims after the sub-prime debacle, a U.S. bank regulator is now warning seniors about reverse mortgages, a subject I wrote about for the L.A. Times in February of 2008. Reverse mortgages could be the next subprime mortgage product to experience rapid growth while taking advantage of a vulnerable segment of the population, top U.S. bank regulator John Dugan said Monday. Reverse mortgages are complicated loans targeted at homeowners who are at least 62 years old, and allow older Americans to live off the equity in their homes as they age. The great majority of reverse mortgages are insured by the Federal Housing Administration and pose limited credit risk. But Dugan said a different class of reverse mortgages -- "proprietary" products -- offer less consumer protections. He said regulators need to set more standards for proprietary reverse mortgages. Regulators also need to be vigilant about misleading marketing and need to crack down on any lenders who try to bundle a reverse mortgage with other financial products, such as an annuity or life insurance product, Dugan said. Is there a VAT in our future? The pain points for builders when it comes to appraisal issues mostly fall into three categories that add up to one outcome: further price erosion. First, builders have complained that under the new rules, lenders are selecting appraisers from a generic pool, which is resulting in what they feel are inaccurate valuations. Prior to the code's implementation, many lenders had appraisers assigned to specific projects and submarkets. Now, builders have argued, appraisers are being assigned work on a random basis, so fewer of them come equipped with specific knowledge of the submarket or project, which in turn, is affecting appraisal values.. The second issue, for builders, is that appraisers have begun factoring foreclosures and short-sales into their comparative analyses. Many builders felt that was unfair because by mixing distress properties with true market rate properties, values would be driven down more than they already have been. 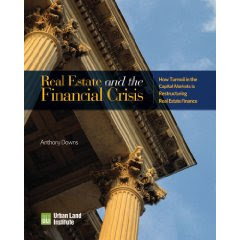 My review of the book "Real Estate and the Financial Crisis: How Turmoil in the Capital Markets is Restructuring Real Estate Finance"by economist and real estate writer Anthony Downs is now online at Inman News. As a senior fellow at the well-respected Brookings Institution, a Washington, D.C., think tank with decades spent studying real estate markets, Downs didn't have to rely much on outside experts: in fact, he said that most of his research was conducted on the Internet. He cautions, though, that for the research novice it's often difficult to distinguish between fact and fiction on the World Wide (and wild) Web. Downs, with 26 other books and more than 500 articles to his credit, has taken readers down similar paths before, including 2007's "Niagara of Capital: How Global Capital Has Transformed Housing and Real Estate Markets" as well as "An Economic Theory of Democracy" (1957) and "Inside Bureaucracy" (1967), the latter two of which are considered academic classics. Towards the end of the book, Downs gets out his economic crystal ball to peer ahead into the future, and what he sees still remains a bit murky: a credit crunch lasting another one to three years, the real estate capital market gradually improving as investors grow impatient with other asset classes, but a timeline that will depend greatly on how the broader stock market fares in comparison. Within that context, the author assigns probabilities to four potential future scenarios, including a weak U.S. recession and a speedy recovery by the end of 2009 (15 percent chance); a bad U.S. recession in 2009 and tight credit through 2010 (65 percent); a more serious recession lasting throughout 2010 resulting in a collapse of the dollar and higher interest rates (8 percent); and a recession lasting two to three years including massive federal spending, ongoing inflationary pressures and high interest rates (12 percent). So what is Downs' latest update from my interview with him? A 65 percent chance of a two-year recession (lasting into 2010), and new housing production levels lower in 2009 than in 2008. Let's just hope that it's this scenario that turns out to be true and not the one which leads to rampant inflation, high interest rates and a dollar collapse. I also interviewed author Downs for my show at BlogTalkRadio, which you can either listen to here or by clicking on the audio player on the right margin of this blog. Want to buy this book? Click here or on the link below. How would YOU end California's budget deficit? Yes, I've been a bit remiss about blogging lately, but that's because impacts of the recession have left me personally distracted, which meant that the poor Housing Chronicles blog was temporarily sent to the corner. The income properties I have which have helped me weather the current storm also saddled me with multiple occupancies to fill as well as various maintenance items to address (new carpet, paint, repairs, etc.). Although renters always want their entire deposits returned, they seem to forget that ripping out something from a wall (and taking out plaster with it) does indeed incur a cost. At the same time, rents have softened just as more inventory (some of it shadow) has been dumped onto the marketplace. Now as a former renter, I have a pretty good idea of what to do to attract tenants (spruce it up, advertise like mad, price under market, offer rent specials, offer unusual benefits such as free on-site laundry, be flexible), but it's hard to do all of that, run a consulting practice AND continue to blog regularly. So if you missed my snark, I do apologize, but things are now largely back under control, so blogging should resume at its normal pace today. But when I blog about changes in home prices or rents, etc., I'm also experiencing it at the same time. 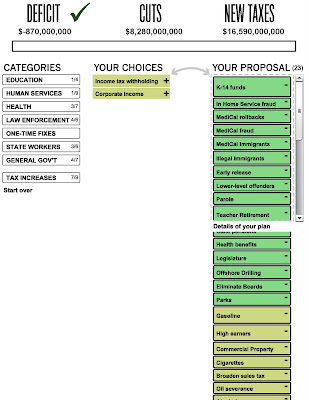 So just as I've been managing my own revenue vs. surplus/deficit scenario, I learned about an interesting interactive feature on the L.A. Times Web site on the decisions YOU might make to balance the budget. I went through the exercise and managed to get a small surplus of about $800 million. Want to check it out? Click here.